Baltimore County’s 29 volunteer, rescue, and rehab companies will receive more than $9.7 million in financial support from Baltimore County for Fiscal Year 2019. The county support to the volunteers represents an increase of about $600,000 over last year. The formal announcement of the County’s FY19 contribution to the volunteers was made September 20 at the annual meeting of the Baltimore County Volunteer Firemen’s Association, held at Glyndon Volunteer Fire Co. The $9.7 million includes subsidies and reimbursements for gear, fuel, utilities, repairs, public education and other expenses. It also includes financial incentives to be paid out over the course of the year to the 21 volunteer companies that provide medic service. This “attended status” program rewards companies that staff medic units during hours of high demand. In 2017, calls for emergency medical service accounted for 101,000 of BCoFD’s 138,000 total calls for service. The volunteer companies are independent corporations that receive the majority of their funding from Baltimore County. Every day, they work side by side with Baltimore County Fire Department and personnel from its 25 career stations. 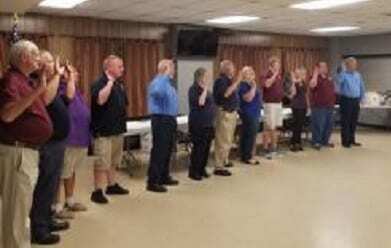 The BCVFA, the umbrella organization BCVFA officers for 2019 were sworn in on Sept. 20. representing the local volunteer companies, elected new officers at the September 20 meeting. The new President is John McDowell (Arbutus). Tom Ludwig (Wise Ave.), is senior vice president; Sue Bollinger (Glyndon), Vice President – Finance; Jeff Wickline (Upperco) Vice President – Operations; Michele Crumbacker (Upperco), Vice President – Admionistration; Robert Frank (Middle River & White Marsh), Secretary; William Kern (Woodlawn), Treasurer; Donna Kern (Woodlawn), Financial Secretary; Glenn Resnick (Pikesville), Immediate Past President.